Fast Cash For Junk Cars will accept your vehicle regardless of make, model, or condition and pay you on the spot. That’s right--the car that’s been sitting in your garage collecting dust for the past year? Trade it in today and do your wallet a favor! Our junk car removal experts are on hand to provide you with a quick quote and pickup time that works around your schedule. 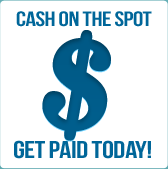 Whether your car is damaged, dead, or you're just sick of it taking up space in your garage, we’ll get you cash fast! Junk car removal shouldn’t be a hassle. At Fast Cash for Junk Cars, we make it as simple as possible for you to get rid of your vehicle and get the money you deserve. We’ll pick up your scrap car at a time that works for you, and in most cases, you don’t even have to be present. Best of all, the service is 100% free, and we can work with you whether your paperwork is in order or not. Whatever the vehicle's condition, we’ll cart your automobile away, leaving you with more space in your driveway and cash in your pocket. Getting your scrap car from your garage or driveway and into our hands starts with just a simple phone call. Dial 1-877-529-6757 and one of our knowledgeable customer service reps will provide a quote and schedule a pickup time. It’s that easy! You can even use our online form to provide your personal and vehicle information, and we’ll send a return email as soon as possible to save you the hassle. Scrap it fast and get the cash with junk car removal services from Fast Cash For Junk Cars.